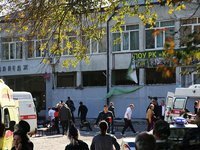 The death toll in the attack at the Kerch Polytechnic School has reached 19. "I confirm, 19 people have died," Sergei Astankin, the director of the Crimean Catastrophe Medicine Center, told Interfax. An informed source told Interfax earlier that one of the people who were injured had died in a hospital.